Disclaimer: I have to seriously apologize for this manicure! I did it at night and it looked amazing in the dim light and then when I woke up and saw this holographic awesome-ness in the daylight, I noticed all the little air bubbles. I was thinking about not posting this, but screw that I really loved this polish! 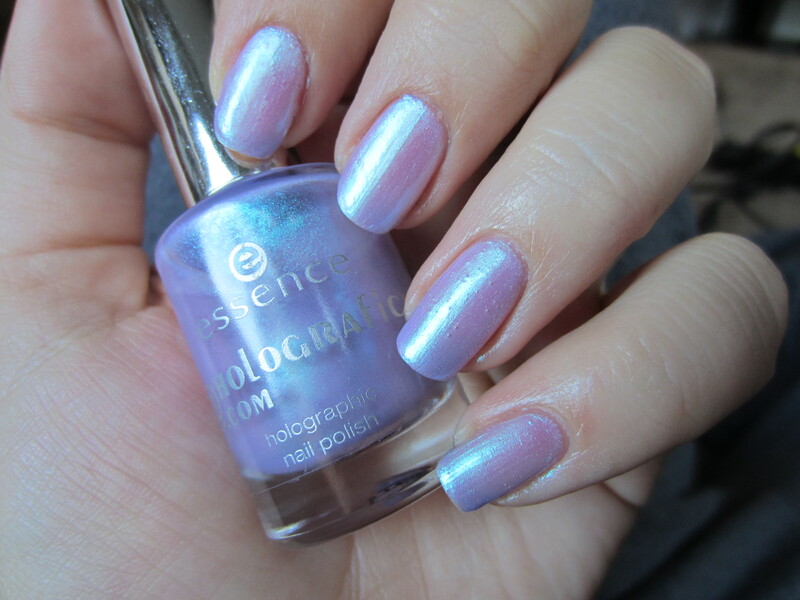 I saw that Essence came out with a line of “holographic” polishes about a month and a half ago. I don’t know why they called this collection “holographic” because it is undeniably a collection of all light duochromes! I was really shocked because this line is comprised of bottles that are twice the size of normal Essence bottles! Essence is normally a $0.99 little mini bottle and these are $1.99 for a full size bottle, which is just common sense. But a really inexpensive brand doing an all duochrome collection? I haven’t heard of that and normally there will just be one or two duochromes released. I picked up this one for a particular reason and it was calling to me when I saw the display at my Ulta. When I first got into nail polish I was obsessed with this one color from Sinful Colors. Me and my best friend both called it our signature color because it was this sheer light pinkish purple duochrome that flashed to bright blue and a pearl hue. 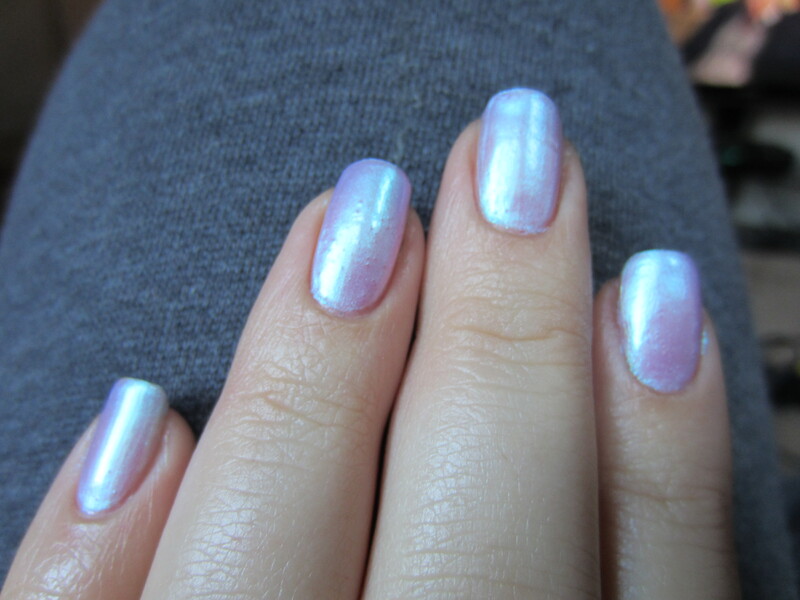 It would look like deep pink in some lights and then in others like this electric light blue and because it was relatively sheer, you could build it up for more intensity or just do 2 coats and have a really nice sheen to your nail. When we were first getting into nail polish, we weren’t all about the bright bright pinks or reds or anything that would draw attention to our amateur paint job, so that color was perfect for us. And as we learned more about polish and expanded our collections, that color was still a staple for both of us. I think I purchased 2 or 3 bottles of it and it was my signature color when I had to file all my nails down because of a bad break and I wanted a pretty and unique color but nothing to draw attention to my horrible nails. But sadly, Sinful Colors reformulated the color and instead of this beautiful pinkish purple they turned it into a deeper blue purple that had a pearly white duochrome. While that color is still really pretty, it’s not my signature color and once I was out of my bottle I didn’t go back to the store to pick up the new one. So when I saw this beauty I grabbed it because it is semi-similar. Although it doesn’t have a pink tone, it does have the same purple and the same flash of light blue and pearl that I loved so much. And this polish has the same finish and consistency of my old favorite. This is 3 coats and I can still see a little bit of a visable nail line, so it can be worn sheer and it gives an extremely beautiful glisten to the nails or you can layer it on and achieve this look. I absolutely love this polish and I’m so happy it gave me a close enough look that used to be my go to polish. 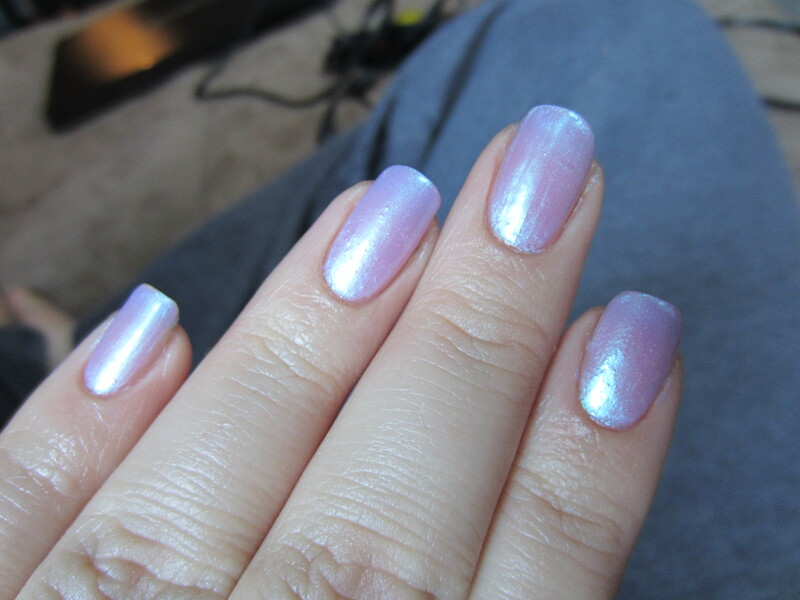 I want to go back to the store and stock up on more “holographic” (but not actually holographic) polishes from essence because this one made such an impression. The application was so smooth, not streaky at all and although it may seem like this polish is thick because of the air bubbles (which were my fault, not the polish), its actually a pretty thin formula. Battle of the Black Holos!! ← Shausha is a Traffic-Stopper!